Teacher contracts are best known for defining salary, benefits, and working conditions in public schools. But that’s only a small part of what they do. They also spell out — sometimes in excruciating detail — the way day-to-day operations of a school district will be conducted, particularly in large cities. Other than those tasked with its interpretation, the only people digging through a several-hundred-page collective bargaining agreement are those desperate for guidance in solving a personal workplace problem. Still, there are provisions in these three large contracts that provide some insight — and even amusement. Teachers serving faithfully on committees like these on top of the usual staff meetings could plausibly have time for little else. The Los Angeles contract addresses this potential problem with a provision that limits the total number of meetings to 30 per school year and not more than four in any month. Nor are they to exceed one hour in length. • Union security. Collective bargaining agreements deal with the relationship between employer and employee, but the union itself is a third party. Many provisions have little or nothing to do with teachers or the district. Each contract defines how many union representatives will be released from normal duties to perform union work. Union officers are routinely granted leaves of absence. Typically the union picks up their salaries, but they continue to advance on the salary schedule for the years they work for the union. 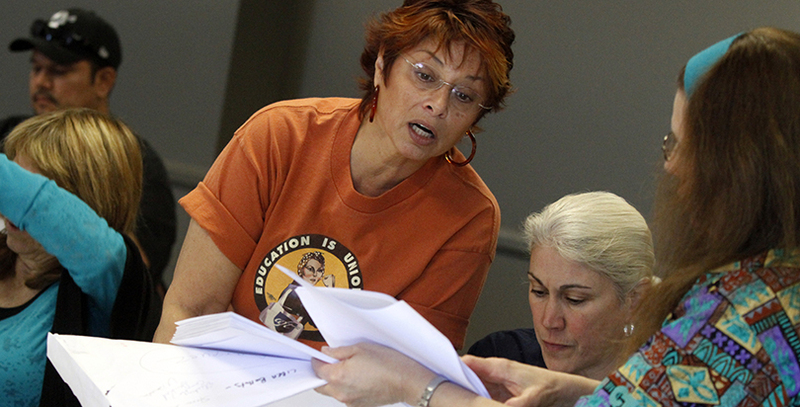 In New York City, up to 50 UFT members can be released to work full time for the union. In Chicago it’s 45, and in Los Angeles it’s seven. But the Los Angeles contract also allows the union to designate an unlimited number of members to do union work for up to 25 days per year each. United Teachers Los Angeles pays for a substitute. Most contracts have a provision giving teachers the right to have a union rep present during any disciplinary hearing or conference with a superior. The UTLA contract adds a unique proviso: The employee can be accompanied by “any other person so long as that person is not a representative of another employee organization.” If your associate or sister is a Teamster, they wait outside. To protect themselves, unions also have contract provisions regarding charter schools. The sequence in Chicago’s contract saying that “there will be a net zero increase in the number of Board authorized charter schools” has received a lot of attention, but the New York and Los Angeles contracts also specify the union’s role in charter conversions. The New York contract notes that while the state’s charter school conversion law places that decision in the hands of parents, the board and the union “shall undertake a joint review of the impact of conferring charter status on the school” if a majority of the staff opposes conversion. • Layoff tie-breakers. The word “seniority” appears 113 times in the New York City contract, but at no point does the contract describe a procedure if two or more teachers share the same amount of seniority. Such a case is not unusual in larger districts, where hundreds of new teachers might all begin their employment on the same day. Typically this is dealt with by lot, or some other random procedure. The Chicago contract is rare in that it allows for teachers rated unsatisfactory on performance evaluations to be laid off first, regardless of seniority. Substitutes or temporary teachers go next, then probationary teachers, then low-scoring tenured teachers — each before all other tenured teachers. Ties are less likely under such a system, but the Chicago contract offers no tie-breaking system. The seniority number for each employee includes a six digit number representing the year, month and day (660912 = September 12, 1966) on which the employee began probationary employment… Each number is followed by a five digit random number. Such random number consists of the last four digits of the employee’s Social Security number reversed followed by the sum of the two preceding numbers. When such sum is two digits, the second digit is used. The combination of the date number and random number provides the seniority number. When comparing two employees with the same employment date, the employee with the smaller employment number is deemed to be the senior. For some reason the district and union find this to be preferable to laying off the less capable teacher. • Work-to-rule in reverse. Work-to-rule is a tactic employed almost exclusively by unions during labor disputes. The union instructs its members to perform only the work required by the contract and nothing more. The idea is to illustrate how much members do beyond what’s contracted for and to pressure the district to relent. However, an examination of these three contracts indicates that the method could be a double-edged sword. The New York City contract specifically states that “No teacher shall engage in Union activities during the time he/she is assigned to teaching or other duties” unless he or she is actually involved in contract negotiations. A labor dispute is the time this provision is most likely to be violated. A provision in the Los Angeles contract would also make work-to-rule there difficult to do. It states that employees are responsible not only for classroom duties but also for “all related professional duties,” and goes on to list 16 examples. Teachers in New York don’t lose sick bank days for absence due to measles, mumps, or chicken pox, but might for German measles. Teachers in New York can’t be disciplined for the format of their bulletin boards or the arrangement of classroom furniture. Teachers in Los Angeles are allowed to suspend students for possession of snuff or betel. Teachers in Chicago cannot be required to empty trash or return furniture to its proper place. In most districts, details of collective bargaining are kept secret from ordinary citizens. Once a tentative agreement is reached and made public, it is usually too late to affect its contents. All the more reason to be familiar with your local contract: There’s almost always a reason for why things are done a certain way. If you can find it.